Does factory overclock make this the 5770 to get? The best-performing 5770 when it comes to games, but not by much. Pre-overclocked cards are always a bit of a gamble, and the penny turns on a number of factors. How overclockable is the GPU in the first instance? Does it offer much headroom to the manufacturer? The same goes with the memory. And the price of overclocking at a hardware level, as we all know, is heat generation, which often means an extra premium for a special non-standard cooler. In the case of Gigabyte's latest entry into its premium Super Overclock range, all these factors apply. 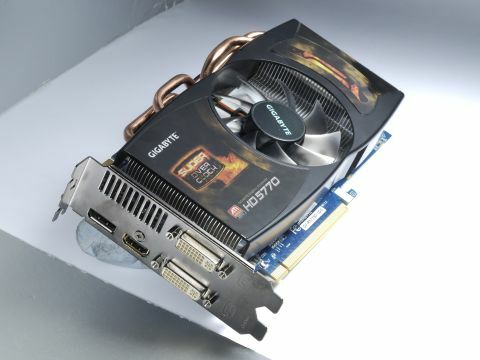 It's a big old card, and the cooler inspires confidence, with its chunky, copper-piped heatsink. But looking at the specs against the standard reference HD 5770, we see that Gigabyte's GPU is only clocked at 50MHz higher than reference 5770s, with no gain on the memory speed. Is this enough to elevate the card's performance above its peers? Head over to the next page for the all-important benchmarks.